East Coast restaurant chain featuring massive meat cuts and an extensive wine list. 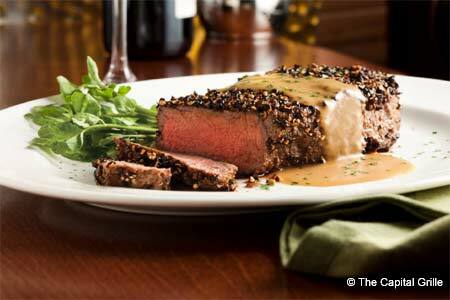 : South Coast Plaza hosts this outpost of the East Coast steakhouse chain. Walk up the Persian-carpeted stairs to a clubby space with leather booths, cut-glass separators, Victorian-style lighting, classic paintings and a long wooden bar. Traditional American starters include clam chowder, fresh oysters, French onion soup, steak tartare and Caesar salad. Order a few sides (Parmesan truffle fries, lobster mac ‘n’ cheese, creamed spinach with béchamel sauce, roasted wild mushrooms) and then a massive steak like the flavorful porcini mushroom-crusted bone-in rib-eye or the steak au poivre with Courvoisier cream. Still hungry? A giant slice of hazelnut chocolate cake feeds the whole table. The wine list features 350 varietals culled from some of the world's most esteemed appellations.